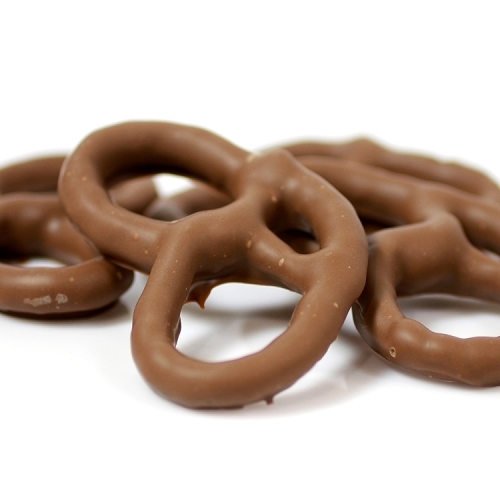 An amazing pretzel crunch melts into a flavorful combination of creamy, salt accented chocolate with rich buttery toffee overtones. Simply Delicious. Available in a 6oz Snack Bag or a One Pound Gift Box. Had the dark chocolate ones, YUM! Everyone loved them, crunchy without nuts for those who can't have nuts - could've fooled me. I absolutely love my Zany Nuggets. I end up at The Chocolate Factory at least every other month just so I can get my hands on one of these snack bags. It crunchy zany nuggets just hit the spot! I visit the Windsor location frequently. I'm in the neighborhood. I sample many of the offerings but choose Zany Nuggets most often. I've never tasted anything like them. 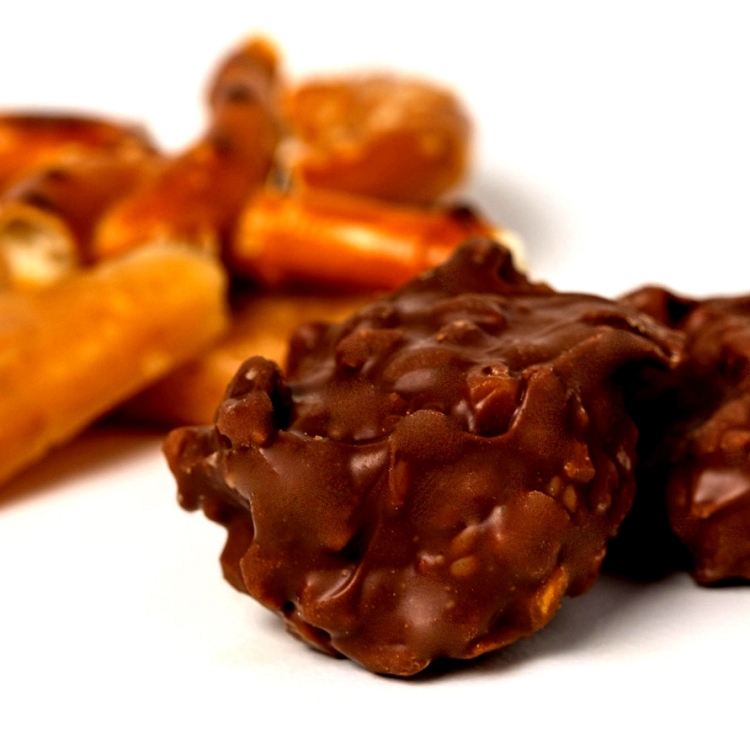 It is a great combination of salty and sweet, toffee and pretzels! I've introduced many family members to Zany Nuggets and everyone likes them too. David Bradley is my favorite place to shop for gifts. Especially for myself! Ever hide candy from your family? Well, I shamefully do :) Zany Nuggets are so delicious that I just can't bring myself to share :) Twice a month I drive over 13 miles to indulge in the sweet, salty, crunchy, toffee taste that's to die for. One bite and I guarantee you'll be hooked. For an extra added delight try popping them in the fridge first. Oh so yummy! Discovered this amazing treat when I stumbled upon the factory off Route 130 this weekend. The lovely ladies kept bringing out various samples for us to try and while they were all absolutely amazing these Zany Nuggets really blew my socks off! 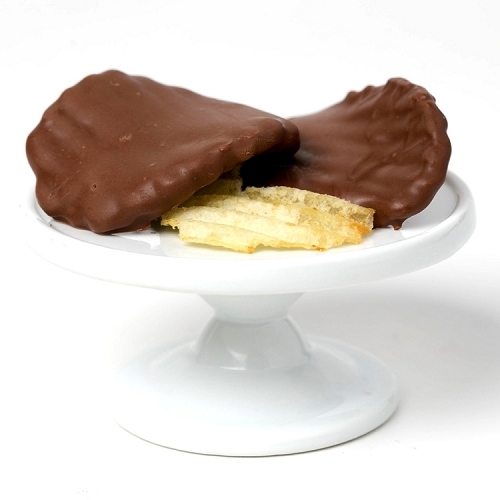 It has the sweet and salty juxtaposition and crunch of a chocolate covered pretzel but the fun of a cluster. Went home with two bags (one for sharing and one just for me, lol!) and will definitely be back for more! These are amazing, my favorite chocolate ever! I found one in a discounted bag of chocolates I purchased and made my husband return to the store shortly after to purchase more! I bought a bag for a friend and her intent was to take it home with her. The chocolate was so rich and delicious and the combination of crispy sweet and salty so perfect that we ended up eating the bag in just one day. Now I have to go back and buy another bag! Yay!! I had the chance to sample these before they were officially offered to the public. I had been discussing the awesomeness of their chocolate-covered pretzels w/ an employee and she offered me one of these to try. 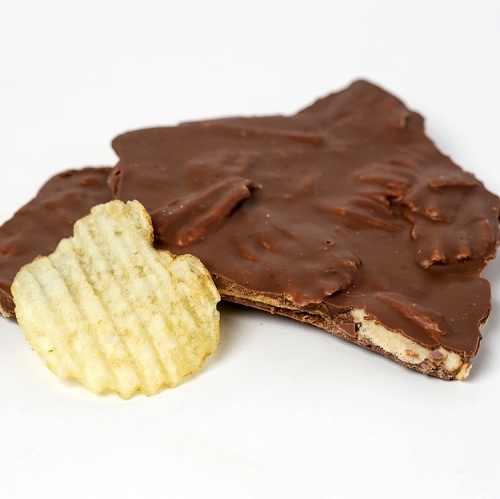 What an incredible combination of salty crushed pretzel and the sweet chocolate AND salty-sweetness toffee. One of my all-time favs...I never leave without at least one bag.